TAIPEI CITY, Chinese Taipei (April 15, 2015) — Taipei City is ready for the 1st Asian Para-Taekwondo Championships. The inaugural Asian para-taekwondo event will take place on April 17, 2015 at the gymnasium of the University of Taipei. A total of 26 athletes from 10 countries are expected to compete for top honors at the 1st Asian Para-Taekwondo Championships on an entry basis. Iran tops other countries in the number of athletes to be dispatched for the Asian event with seven, followed by Mongolia with five and Nepal with three. Korea, the Philippines, Uzbekistan and the United States will send two athletes each, while the UAE, Japan and Kazakhstan will send one athlete each. On April 15, a WTF classification of para-taekwondo athletes was implemented smoothly. Headed by the Netherlands' Joan Steele-Mills, the classification will continue until April 16. Irish David O'Sullivan serves as the technical classifier at this 1st Asian Para-Taekwondo Championships. "We are fully ready for the 1t Asian Para-Taekwondo Championships and the Para-Taekwondo Championships have a special meaning as they take place just several months after the IPC voted to include taekwondo as an official sport in the 2020 Tokyo Paralympic Games," said An-chin Hsu, chairman of the Organizing Committee for the 1st Asian Para-Taekwondo Championships and four other championships - the 8th Asian Junior Taekwondo Championships; the 3rd Asian Junior Taekwondo Poomsae Championships; the 1st Asian Cadet Championships; and the 1st Asian Cadet Taekwondo Poomsae Championships. Hsu, who also serves as president of the Chinese Taipei Taekwondo Association, said, "Chinese Taipei is eager to host as many international taekwondo championships as possible, thus helping encourage our athletes' participation and make our taekwondo better." Kyu-seok Lee, president of the Asian Taekwondo Union (ATU), said, "I am glad to meet Asian juniors, cadets and para-taekwondo families here in Taipei City." "We are especially happy to see the 1st Asian Para-Taekwondo Championships take place here." Bong Yi, new secretary general of the ATU, said the ATU would encourage more its member nations to participate in Asian and world para-taekwondo events. Most of the para-taekwondo athletes, who underwent their classification, expressed their enthusiasm over taekwondo's inclusion in the 2020 Tokyo Paralympic Games and were eager to compete at the 2020 Paralympics for a medal. 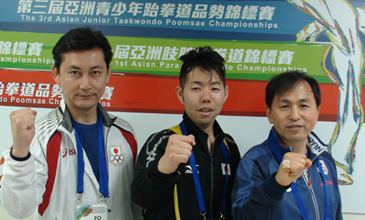 "Taekwondo is now on the official program of the 2020 Tokyo Paralympic Games. I am really excited about the news," said Carlo Guarin from the Philippines. "I want to win a medal at the 2020 Tokyo Paralympics. Taekwondo is really my life." Ankhbayar Gankyuu from Mongolia said, "I participated in the 1st WTF World Para-Taekwondo Championships in 2009 in Baku, Azerbaijan and the 2nd Championships in St. Petersburg, Russia in 2010, and the 4th Championships in Lausanne, Switzerland in 2013 and the 5th Championships in Moscow, Russia. At the 5th championships, I won the gold medal in an open class." "I want to compete at 2020 Tokyo Paralympics and win the gold medal," he said. Hiroki Sugita from Japan said, "I will compete at the 2020 Tokyo Paralympic Games to be held in my country and hope to win a medal." "Taekwondo is my life and it gives hope and dreams to all para-taekwondo athletes. Thank you WTF."